Due to the growth of computer technologies and web technologies, we can easily collect and store large amounts of text data. We can believe that the data include useful knowledge. Text mining techniques have been studied aggressively in order to extract the knowledge from the data since late 1990s. Even if many important techniques have been developed, the text mining research field continues to expand for the needs arising from various application fields. The purpose of Text Mining is to process unstructured information, extract meaningful numeric indices from the text, and, thus, make the information contained in the text accessible to the various data mining algorithms. Information can be extracted to derive summaries for the words contained in the documents or to compute summaries for the documents based on the words contained in them. Hence, you can analyze words, clusters of words used in documents, etc., or you could analyze documents and determine similarities between them or how they are related to other variables of interest in the data mining project. 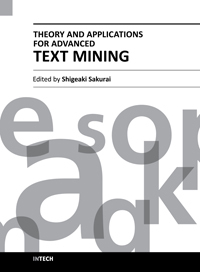 This book is composed of 9 chapters introducing advanced text mining techniques. They are various techniques from relation extraction to under or less resourced language. I believe that this book will give new knowledge in the text mining field and help many readers open their new research fields. Text mining can help an organization derive potentially valuable business insights from text-based content such as word documents, email and postings on social media streams like Facebook, Twitter and LinkedIn. Mining unstructured data with natural language processing (NLP), statistical modeling and machine learning techniques can be challenging, however, because natural language text is often inconsistent. It contains ambiguities caused by inconsistent syntax and semantics, including slang, language specific to vertical industries and age groups, double entendres and sarcasm. Unstructured text is very common, and in fact may represent the majority of information available to a particular research or data mining project. Even if many important techniques have been developed, the text mining research field continues to expand for the needs arising from various application fields.